"This yummy recipe won my mom a blue ribbon at the Wisconsin State Fair. It is very beautiful and flavorful!" Fill a large pot with lightly salted water and bring to a rolling boil over high heat. Once the water is boiling, stir in the orzo, and return to a boil. Cook the pasta uncovered, stirring occasionally, until the pasta has cooked through, but is still firm to the bite, about 11 minutes. Drain well in a colander set in the sink, transfer to a bowl, and let cool in the refrigerator. In a small bowl, whisk together the olive oil, red wine vinegar, Dijon mustard, garlic powder, oregano, basil, onion powder, salt, and pepper. 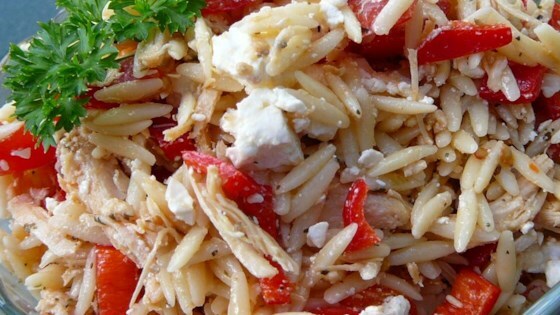 In a large bowl, stir together the cooked orzo, tomatoes, olives, feta cheese, and chicken breast meat until thoroughly combined. Pour the dressing over the orzo mixture, lightly mix to coat all ingredients with dressing, and spoon into the red pepper halves. Garnish each serving with an oregano sprig. This was really, really good. I liked the dressing a lot. Didn't use red pepper cups, and added some fresh parsley from the garden. Thanks! Very tasty! Did not make any changes, per se, but did leave out the olives and fresh sprigs for topping it.